Benzema revals his "dream club"
Thierry Henry has said that he wants to finish his career in USA with good friend David Beckham. 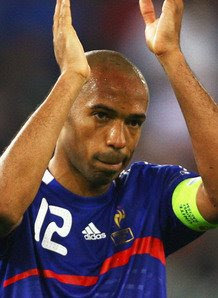 Henry,31, looks as if he will ignore interest from English clubs to see his career out in America. I'm sure there are a number of clubs that would love to have one of the Premierships all time great goal-scorers back. "When my career in Europe ends I've always said I'd like to play in the United States and it seems that's how it’ll go. "I've been at the top level for 15 years. My career will end soon and as a striker things go more quickly." Personally I think Henry was one of the best striker's of all time and a move to USA could be good for him to role back the years and show why he got the reputation he has today. 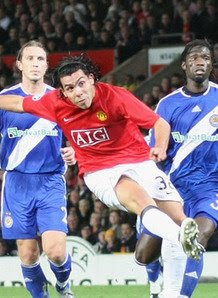 Reports today have reviled that Arsenal are looking to sign Manchester United striker Carols Tevez. Tevez is currently on a two-year loan deal at United but is reportedly close to securing a full time deal that will cost them £32million which is a lot to pay for a substitute. Wenger looks ready to try signing Tevez from United for £32million as the Argentinean international has found himself on the bench for most of the season after Dimitar Berbatov's arrival in the summer. If Wenger wants to sign Tevez he will have to fork out £32million which would smash Arsenal's current transfer record of £11.5million which they payed for Sylvian Wiltord. Even though Manchester United are reluctant to sign Tevez I'm sure Sir Alex would defiantly be unwilling to sell such a talented player to such big rivals. Mikael Silvestre was allowed to leave Manchester United for Arsenal but the 31-year old did not look as if he had much of a career left at Old Trafford and even at that he was the first player in 20-years to make the move. Personally I feel Tevez is a great player and would hate to see him leave Old Trafford as I am a United fan but could understand the decision by both him and Ferguson because of the situation. In other news Arsenal have also been linked to join in the battle to sign Russian play maker Arshavin and £8million rated Udinese midfielder Gokhan Inler. Spanish sourses say Real complete signing of "Kun"
Reports in Spain have today said Real Madrid have signed 20-year-old superstar Sergio "Kun" Aguero. The Argentina international plays for Real Madrid's local rivals Atletico Madrid and Real have reportedly agreed a deal for him to move to The Bernabeau in January. Aguero was strongly linked with a move to Manchester City but Real Madrid look to have beaten them to Aguero just as they did for Portsmouth midfielder Lassana Diarra. Aguero who has been compared to the legendary Diego Maradona signed for Atletico in 2006 and signed a six-year contract but now looks to be on his way to Real Madrid who are reportedly more than willing to pay off his £40million contract clause. 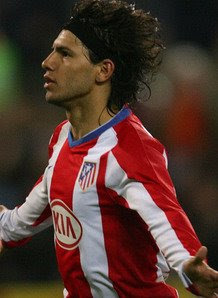 Aguero has scored just under 50 goals in a three year spell at Atletico that's scene him play 112 times. If the reports are true Real Madrid will have snapped up one of the most promising players in the world with a huge career ahead of him as hes still only 20-years old. I personal find the rumor hard to believe as Real have just signed Ajax striker Klaas-Jan Hunterlaar. It would be a shame to see Aguero go to Real as they have so many world class players and he might not get week in week out football he needs to become one of the best players in the world.